Live Music ~ Creates the right mood at receptions. 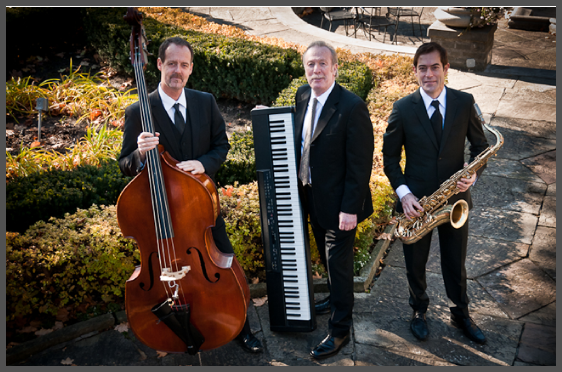 Our light jazz ensemble offers classy, elegant and interesting ambient music. All songs are selected to reflect your vision of the day. Familiar yet entertaining, our music is played creatively and at the right volume. You’ll hear selections from a diverse range of artists: Gershwin, Ray Charles, Jason Mraz, Sting, Van Morrison and others. All from a repertoire of over 2000 songs. While we perform often as a jazz trio using keyboard/vocals, string bass and saxophone, we also mix perfectly with drums, female vocalist and other instruments as well. The proof? Listen to our demo CD.